-thoroughly wash the kale and pat dry. Lay the kale flat on your cutting board to remove the thick inner ribbing. This part of the kale is particularly bitter and can be tough to chew through. Better to get rid of it. 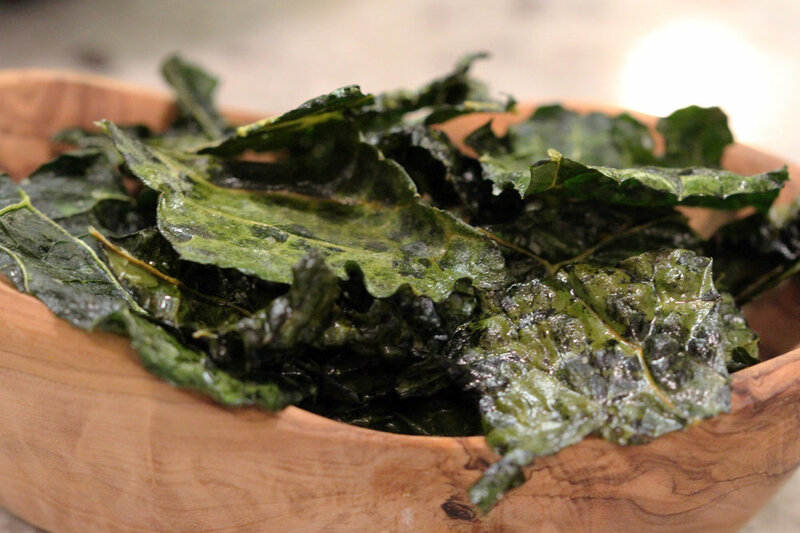 -slice the kale leaves into whatever size chips you'd like. Not too big, not too small. Add them to a large bowl and drizzle with olive oil. The important part here is to massage the oil into the kale. Otherwise, you'll notice the oil just sits on top and doesn't properly coat each piece. This step is crucial for extra delicious kale chips- do not skip. -place in the oven and bake for 15-20 minutes until lightly crisp and dehydrated. You may need to keep checking them to make sure they are doing alright. You'll know once they are perfect. -allow chips to cool completely before transferring to a sealed container. Enjoy! There are so many different ways you could make these kale chips! I love adding a bit of lemon juice for an acidic kick or just sticking with olive oil and sprinkling over some of my favourite dried herbs and spices like garlic and smoked paprika. Either way you can't go wrong with these delicious crunchy chips. Even if you think you're not a "kale fan", give these a try. When they are baked up and crispy, you'd almost never realize you are eating kale. The grassy, bitter flavour that is associated with raw kale goes away and you're left with delicious and crunchy snack that is chock full of nutrients. As a leafy green, kale is a nutrition powerhouse that loaded with the good stuff. id you know that kale is a part of the cruciferous vegetable family? Think broccoli, cauliflower and cabbage as close relatives to this particular green. This powerful family of vegetables is well-known to contain high amounts of sulfur which is a crucial nutrient that helps out our liver and its detoxification pathways. Kale is also a concentrated source of the carotenoids lutein and zeaxanthin. These nutrients have been shown to promote eye and vision health. Lutein-rich foods like kale can help reduce the risk of developing cataracts. While it's usually best to include a raw preparation of this green in your diet, these kale chips are a nice alternative to always eating bowls of raw kale. Especially if you are a snacker and you like having something to crunch on, these chips are a great alternative to crackers, chips and other salty snacks you would typically buy.